The 3 star Hotel Giulietta , run by the Arcangeli family for thirty years, is located right in front of the port of Riccione, a few steps from the sea. It offers family-friendly holidays and has a heated outdoor pool, children's facilities, entertainment for all ages, free WI-FI and free bicycles. Pets allowed on request. 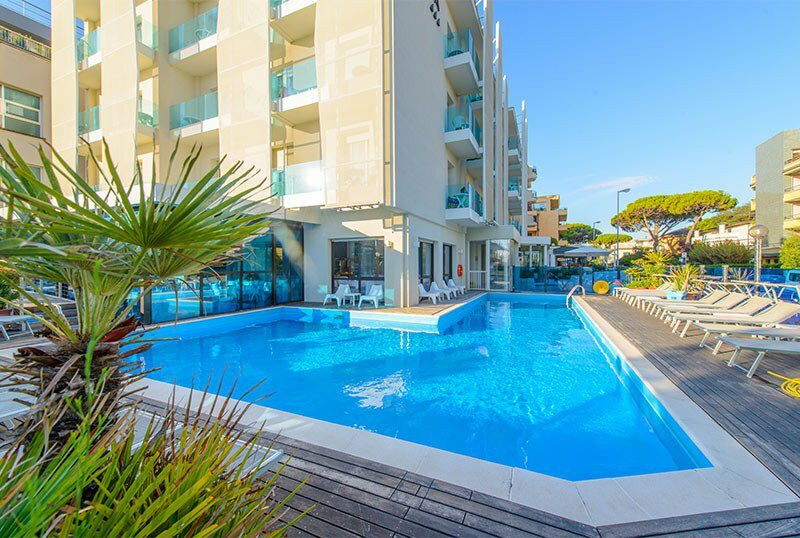 The hotel is located in Riccione just in front of the port, a few steps from the beach, in a charming tourist area full of fish and local restaurants. With a 5-minute walk along Viale Dante, you can easily reach Viale Ceccarini. ROMEO: with French balcony and internal view. GIULIETTA: completely renovated, have a balcony with a frontal or side sea view on the port. FAMILY: composed of two connecting rooms with entrance and two bathrooms, 2 LCD satellite TV, 2 minibars, a small balcony with sea view. JUNIOR SUITE: composed of a single environment, they are tastefully furnished and can accommodate up to 4 people. They have a frontal sea view on the port of Riccione. Large heated outdoor pool and equipped with solarium area with beach towels available, open-air porch, sun terrace, free use of bicycles, reading room, elevator, entertainment for adults and children, Sunday aperitif, theme nights, beach towel. On request: laundry service, bike rental for a fee. CONVENTIONS: beach, discos, gym, amusement parks, spas, swimming pool. On request shuttle service and organized excursions. BREAKFAST: international buffet to be enjoyed by the pool. It includes homemade desserts, yogurt, cereals, brioche, coffee and cappuccino. LUNCH AND DINNER: local cuisine buffet with over 25 courses including appetizers, starters, main courses, side dishes, fruit and desserts. Always present the specialties from Romagna, from piadina to fresh fish from the Adriatic Sea. VARIATIONS: vegan and gluten-free cuisine on request. In hotel: strollers, outdoor playground area, changing table in the hall, summer entertainment. On request: pediatrician and baby sitter. In the room: cots on request, safety rails, courtesy light, reducers for toilets, bath tubs. At meals: baby food , broths, vegetable soup, baby menu, high chairs, afternoon snack, bottle warmer, sterilizer. On the beach: playground, entertainment, baby sitter. The hotel has a heated outdoor pool surrounded by a sunbathing area with loungers. Guests can request beach towels for free at reception. During the day there are moments of live entertainment. The hotel has an agreement with the Bagni n. 91 and 92. Among the services available: swimming pool, hydromassage, playground, entertainment and baby sitter, pet area, disabled facilities, playgrounds.